I’m looking for photos of how people organize their tool chests or whatever they use for tool storage. I’m not good at organizing things and am wasting a lot of space and a lot of time looking for things, so if you’d like to post photos of what you do, they’d be appreciated. I’m interested in things you can really work from though. I’ve never been able to make good use of Paul’s two-drawer chest, so I’d be particularly interested to see what others have done with that chest, but post whatever you have. I’m after the details here, not just a photo of the outside. I’d like to see what you’ve done to arrange / organize. I really, truly stink at that and am looking for things to copy. Would you believe this is just a little something I put together? They claim the custom-cuts in the foam create a silhouette / negative space which makes recognizing where to return the tool easy and fast, which helps maintain organization. The thinking is that you spend the brainpower one time to optimize tool organization, and then the cut-outs maintain it for you, by bringing the tools back to exactly the same location and orientation each time. It’s natural for a craftsman to want to build one from wood, apprentices start-out making them, but I don’t have the room for wall cabinets or showpiece storage, and I like the idea that all my tools are NOT on display to passers-by. I opted for a Mechanic’s Tool Chest & Rollcab. Lined drawers, drawer dividers, ball-bearing runners… They’re robust, take a lot of weight, and will accommodate everything you need in one place. Just a Top Box will cope with all your woodworking tools (except Panel Saws) with planes laid sideways. I have the Rollcab too – some drawers dedicated to woodworking tools, planes in the deep bottom drawer, other drawers for plumbing tools, socket sets & spanners, decorating tools etc. This one is a little overpriced, but does have nice curves. I went for the Halfords special and a narrow Carpenter’s wooden Tool Chest for Panel Saws. If you bought a side-mounting locker, that would be an ideal saw-till & clamp storage. When you have plenty of drawers, and enough dividers, organising will be simpler. As you’ve invested a lot of time in making Paul’s two-drawer cabinet, why not make a riser box to go underneath that, with enough drawers for all you need? I like @alan141 s suggestion to add a riser box bellow your chest. There is no need to change now. I’ve read a bit about the Seaton tool chest that @etmo posted. I think its obscenely beautifully made. An artwork in itself. Its also really inflexible. Its filled with the very best and most beautiful tools. My tools alone couldn’t compete. Niether do I have a full set of anything. Chris Schwarz has a till-by-till description of his own single tool chest on his blog which could be useful if you need and keep the same tools as him. I have most of my tools in a chest with one till and lots of boxes under the till. The boxes keep blade sets or similar tools together. The tools/boxes are squeezed in wherever they fit, but always in the same place. I think the joiners box that you made allows better access and would save me unpacking the whole chest to get at one spare coping saw blade. Some people seem to keep the tools they use most closest at hand in the top till. But a friend of mine works really well with his tools grouped by type. All his chisels are together, and all saws, all planes, all squares, all meassuring devices are grouped. His are on open shelves, closest to where he uses them. Drawers and tills could be used similarly. Everyone seems to store and arrange their tools differently depending on what works for them. I’m motivated by the thought that if I cant find a tool, I might as well not have it. I’m in the same boat ed, and have decided to build the joiners tool chest, I think it’s a bit better than the more traditional tool chest with drawers, you can fit more in it and if made from pine it’ll be lightweight, and it’s very practical, will take a lot of abuse with the skirting, the design is hard to beat, and the tools will stay well protected from humidity and thieves. In Paul’s video showing different types of toolboxes, he shows us how he organises stuff. 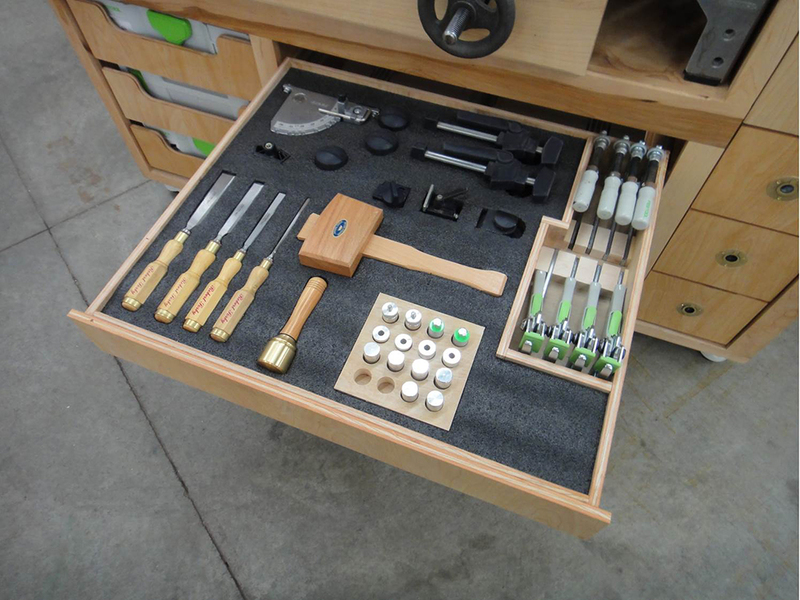 Chisels in one drawer, files in another… but then has this for his workbench drawer. @alan141 Okay, that’s the ticket. I’m done! I built the 2 drawer chest, the joiners and the hanging tool cabinet. I think its important to not look at what others did but what tools you have. The 2 drawer one never worked for me. Probably my own doing. The drawers were just a bit too shallow for some tools. I then built the joiners tool chest. I am using wooden bodied planes that are much bigger. That didn’t work so well either. For me the hanging wall cabinet was the best. I can get about every thing in there. Now I just need to do something about my saws. Rob Cosman has a video on YouTube on building a travel tool chest. When in use everything is easily accessible and it is easily customized for the tools you have. He also describes what tools he takes on the road. I won’t try to give advise but here are some ideas that work for me. This is how I use my shop, I also have a large tool site job box that secures my tools when I want to lock up. My work bench is also the out-feed table for 2 table saws and a router table. The chisel caddies go on the bench when I am doing joinery work but are easily stored when I need the table clear. The chest of drawers store mostly measuring, marking and drilling items. The saw till is directly behind me as I face the workbench vice. One limitation that I face is that my workshop is 80% woodworking but it also houses mechanics, plumbing, and electrical tools. I think one reason that you will get so many different answers is “storage” means different things to everyone. This is how my shop is set up most of the time but if I think “storage”- everything is locked up in the metal job site box. I would not want to dig in a tools chest for every tool while building a project. If I made a tool chest it would be to move tools not just house them. Hope that helps. Great idea @mtaylor. So often we see Tool Cabinets separately from Workbenches, but it seems like like an ovious choice to make use of that space under our workbenches. It adds significant weight to the bench as well. I have a lathe with five 55lb frying pan shaped ingots of lead in the bottom to provide stability. I’ll certainly be adding storage space below the bench I’m building to take advantage of that space. It may be hard to tell from my pictures but I left significant space between the bench top and the shelving to allow for hold-fasts, bench-dogs, etc… This actually works as a great shelf for bench hooks. I went the peg board route on the wall in front of my workbench. It has worked quite well at my keeping things organized. The planes when not in use reside on the shelf under the bench.